I knew I needed to do something different, but I was intimidated. What if my brain shut off and I didn’t ride my horse after I roped a big yearling and I didn’t kick up fast enough and I lost my rope? Cowboys made fun of people who lost their ropes. I didn’t want to get made fun of; I wanted to be perfect. Then one day I watched my boss rope a fast yearling on a roan horse that set up and scotched when he should’ve jumped forward and ran, and he lost his rope. Completely contrary to my expectations, the earth kept turning and the sun remained in its proper place high in the sky. The cowboy took the opportunity to work the roan horse on the cow for a while, since it was educational for the horse and took some of the fresh off the cow. Then, he rode his horse up alongside the winded cow, reached down and retrieved his rope. So, even a professional cowboy who’d been roping outside his whole life could lose his rope and survive the experience. Well, shoot….I might as well give it a try. After learning the basics of working the sick animal out of the bunch and proper heading position, I necked a slow, fat Hereford steer. On the third or fourth try, but who’s counting? Not me; I was officially a header! Holding the rope tight on the front feet was a new experience, and I liked it. Later that summer, we helped a neighboring ranch trail yearlings from their summer country to the home ranch for shipping. By mid-afternoon, we had put nearly all 1,500 yearlings through the gate, and what was left in the drag was tired, worn-out, and hot. Heck, we were all tired, worn-out and hot. A few of the stragglers decided to run back the way we’d come rather than go through the gate. I ran ahead of them on a big flea-bitten gray horse and turned them back once, only to have them make another break for it. I got mad, took my rope down, and put the iron to my horse in hot pursuit of the hot cattle. They’d warned me the gray horse tended to buck when a person leaned out to rope something, but I didn’t care. I was going to put a rope around that red heifer’s neck whether I was riding a horse, standing afoot, or flying through the air. 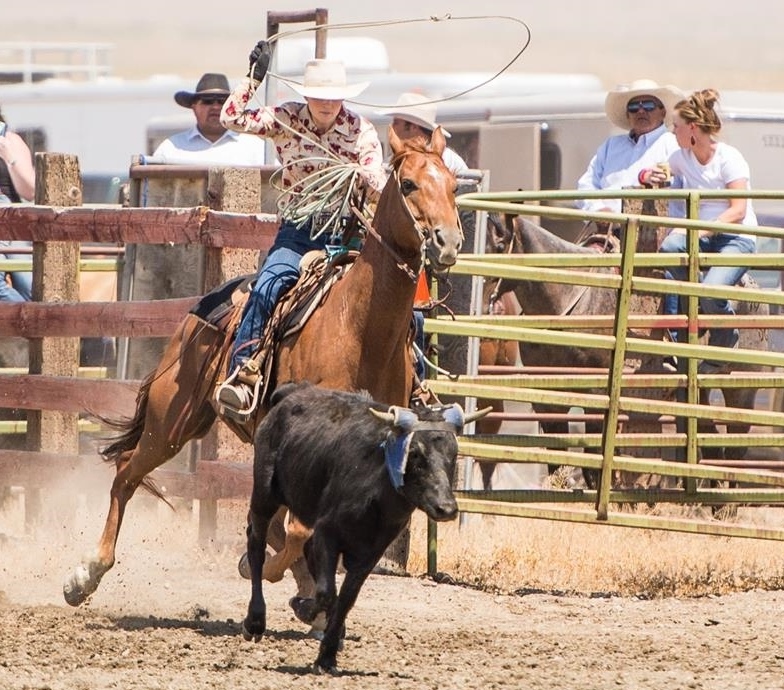 I threw my rope with all the aggression of an exasperated, overheated, petite person who doesn’t believe she is short, and it settled around the steer’s neck. I stacked my dallies on the miserable duck-bill horn of my old saddle, then realized I was still horseback. I knew I would be. I looked over my shoulder to see if anyone was coming to help me, because I had no idea what to do next. My then-almost-boyfriend, now-husband was the first one to trot over the nearest rise. He had his rope down but was riding a colt, so he coached me through leading my captive bovine across the road and through the gate. Then he heeled the yearling, and I nearly drug them both through an H-brace in the fence. You should ask him about that. He seems to get a big charge out of telling that story. Later, Jim told me how proud he was of me for necking that yearling. I was pretty proud, too. What’s the worst that could happen? A person could lose their rope or get bucked off? Heck, that happens to everyone who cowboys for a living. Fear doesn’t mean you shouldn’t attempt new things; it means you should kick up your horse and open your hand anyway. I learned the secret to heading cattle: keep your horse and your dallying hand moving at the same rate of speed until everything comes tight and stops. Now I can even rope in town! So fun! Photo by Kathy Bengoa.